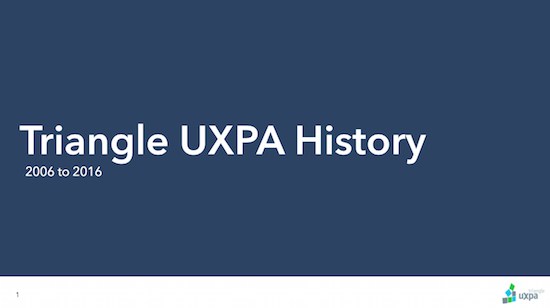 The Triangle UXPA was founded in 2006 and is the North Carolina Raleigh/Durham/Chapel Hill chapter of the User Experience Professionals Association. We are focused on building and supporting the local community of practitioners who craft great user experiences — which include interaction designers, visual designers, information architects, content strategists, and user researchers. Read our Code of Conduct for expectations of all members, attendees, speakers, and sponsors. Dan Klyn (2018), Jim Kalbach (2017 & 2009), Karen Holtzblatt (2017), Donna Lichaw (2017), Susan Weinschenk (2016 & 2018), Abby Covert (2016), Adam Connor (2015), Jeff Patton (2015), Jason Cranford Teague (2014), Whitney Quesenbery (2014), Tomer Sharon (2012), Carol Barnum (2012), Jeff Gothelf (2012), Josh Clark (2012 & 2011), Leah Buley (2010), Edward Tufte (2009), Ginny Redish (2009), Deborah Mayhew (2008), Todd Zaki Warfel (2008).